Rosa Luxemburg and Karl Liebknecht were two of the most outstanding revolutionary figures in history. They dedicated their lives to defending and propagating the objectives of Marxism, and they founded the German Communist Party (KPD). They became leading figures in the German revolution, which ended WWI. 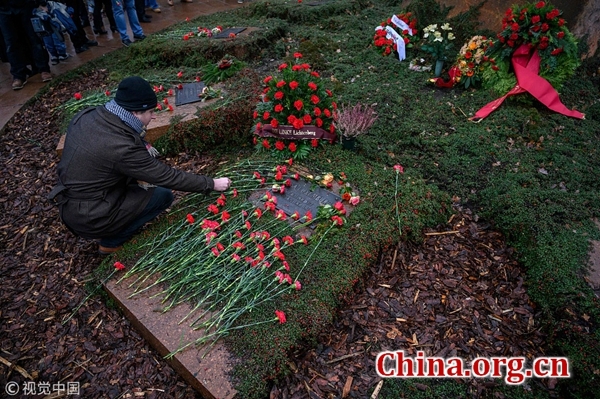 Jan. 15, 2019 marked the 100 year anniversary of their execution, and at this time communists and socialists around the world remember their legacy. Luxemburg and Liebknecht were both born in 1871. Luxemburg was born in Warsaw, Poland to a Jewish family, and became active in politics at the age of 15. While at school she joined the Proletariat Party and helped to organize a general strike which was violently repressed and its leaders executed. Soon after, she fled to Switzerland and studied at Zurich University, where she was awarded a doctorate degree in 1897. She collaborated with fellow revolutionaries from Poland, France, Lithuania, Germany and Russia, and after acquiring German citizenship, she threw herself into work with the German Social Democratic Party (SPD). Karl Liebknecht was the son of Wilhelm Liebknecht and the godson of Karl Marx. He trained as a lawyer, and from an early age was active in the SPD. In 1912, he was elected by the party to the German parliament. His father and August Bebel had been the cofounders of the SPD, which started as an overtly Marxist party. It was the world's strongest and most influential workers' party until 1914, when it capitulated to nationalism and dispatched German workers to the trenches to kill fellow workers from other European countries. In the late 19th century, German capitalism experienced a long period of expansion, which fostered a culture of deal-making between the SPD, the government and employers. This led to a belief that capitalism had changed its basic character, and that Marx's theory of an irreconcilable conflict of interest between capital and labor was outdated. In that case, instead of requiring a revolution, capitalism would be able to evolve into socialism. This revised Marxism was a doctrine of gradual reform, and its leading thinker was Eduard Bernstein, who claimed, "The movement is everything, the final goal nothing." It was Rosa Luxemburg who first identified and directly challenged this process within the SPD. Her book "Reform or Revolution," published in 1900, destroyed Bernstein's evolutionary arguments; and its critique of reformist socialism remains a fresh and vibrant masterpiece of Marxist theory. After 1900, conflicts of interest between the major capitalist powers grew. German capitalism was hemmed in by Imperialist colonization, so the rapid growth of the German economy entailed a direct clash with French, Belgian, Russian and British interests. European competition for markets engulfed the world and provided the fuel that fed the deadly flames of WWI. As war approached, the parties of the Second International met in Basel, Switzerland in 1912. They solemnly resolved to strain every sinew to prevent war, and if war were to break out, to overthrow their governments and the entire socio-economic system of capitalism. However, despite their declarations, the social democratic parties betrayed the workers in 1914 by sending them to war. When hostilities commenced, Luxemburg campaigned against the war, hoping for a general strike to end it. Liebknecht opposed the war in parliament and was dispatched to the Eastern front, where he was forced to bury the dead. He returned to Berlin in 1915 and spoke out on Potsdammer Platz on May 1, 1916, calling for a revolution to end the war. Both Liebknecht and Luxemburg were incarcerated for the rest of the war. Luxemburg's articles and letters written in prison describe dramatic shifts in mass consciousness – from hysterical and joyful celebrations as soldiers left for the front, to the resignation, misery and hunger that followed. It was a time of unprecedented barbarity and utter despair, but from her prison cell Luxemburg prepared for a revolutionary awakening that would end the slaughter. Luxemburg and Liebknecht celebrated the victory of the Russian revolution in 1917. Disgusted at the betrayal by the SPD, they formed a Marxist organization called the Spartacus Bund in 1916, which went on to form the KPD in 1918. It came into existence at the apex of the German revolution, which broke out on Nov. 4, 1918 when a mutiny by the navy in Kiel spread to North Germany and grew into a general revolt against the war, the Kaiser, and the old society. On Nov. 9, revolution reached the capital, Berlin. That day Liebknecht declared the Socialist Republic of Germany from the balcony of the palace, while the SPD leader Friedrich Ebert declared a democratic republic. The Kaiser abdicated and fled the country. Thus, WWI was ended by revolution. Workers, soldiers and sailors elected revolutionary councils, but the SPD leaders still managed to wield enough influence and authority, established over decades, to ride out the initial storm of unrest. Luxemburg and Liebknecht faced the difficult task of building the influence of the KPD, whilst also encouraging the justified anger of the most militant revolutionary fighters against the old order, and against the maneuvers of the SPD leadership. The initiative fell to the SPD leader Friedrich Ebert, who ordered reactionary bands of former soldiers, organized in the so-called Freikorps, to suppress the KPD-led insurgency in Berlin, which was defeated on Jan. 13, 1919. Two days later, Liebknecht and Luxemburg were arrested, interrogated and tortured. Liebknecht was put in a car and killed by a shot from behind. Luxemburg was beaten with rifle butts before she was shot. Her corpse was dumped in a Berlin canal. Rosa Luxemburg and Karl Liebknecht were true revolutionary heroes, and their ideas and legacy will be remembered down the ages. The contributions and sacrifice of two remarkable Marxist revolutionaries in Germany are remembered this week, 100 years after their untimely execution in 1919.